Every human need nutrients for his body to function properly and these nutrients are obtained from food he/she consumes daily. These nutrients include vitamins, minerals, proteins, carbohydrates and essential amino acids etc. People should consume these nutrients in a balanced way according to their body requirement, consuming more than requirement results in obesity and consuming less than requirement results in malnutrition. 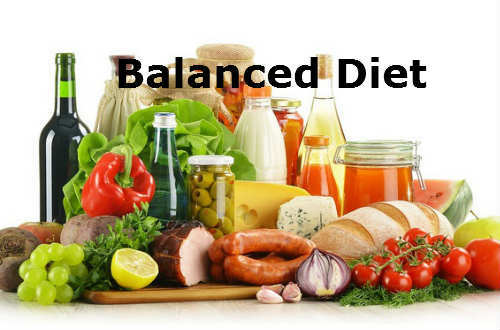 Properly Balanced diet reduces health related risk like heart failure, obesity, diabetes and hypertension. Energy required by every human is calculated in calories an average human requires 2000 to 2500 calories per day to maintain their weight but calories requirement can be varied according to physical activity, age, gender etc, but problem doesn’t lie in amount calories intake by every human almost each and every human take required calories but they end up consuming some nutrients more than requirement while ignoring some. This results in an imbalance which creates health issues. People always want to consume types of food that tastes a lot while ignoring sour and bitter tasting vegetables and fruits, naturally failing to gain the nutrients from that particular vegetables or fruits. That’s why in ayurvedic medicine suggest people to consume all the six taste of food thus leading to a healthy and prosperous life. Some people have this habit of consuming particular type of food everyday whilst ignoring the rest this is a dangerous habit developed many people, mainly due to lack of interest trying new foods or to save time in cooking and consuming foods. This type of routine is mainly seen with working people. Religions prohibit people from consuming certain meat like Hinduism prohibits consumption of beef and pork while Islam prohibits pork, people won’t get nutrients from this particular food but they can always consume from alternative means like drumsticks, beans and catfish etc but most people stay up ignorant and fail consume these nutrients. People who live below poverty line tend to be more malnourished because for them every day surviving is a daunting task, so they never care about importance of a balanced diet. Children of working parents are also prone malnourishment because their parents fail to maintain a balance between work and family care. This is the main and important case of every health issue for a human because people don’t have this awareness of how important a balanced diet is people eat what they wish. Most of us don’t care about our health and some even say that they are working hard while they still can and have no time to have a look in their physical requirement but believe me if you maintain balanced diet along with physical activity you can still work hard in your 90’s. Unhealthy foods are available all around the world with colorful advertisements and gifts. Frozen meats, Instant Noodles, Pre-packaged fruits and vegetables all have lot of sugar and salt sometimes both. Mono sodium glutamate present in these foods contains non-essential amino acids which on regular consumption can lead to asthma, obesity and Chinese restaurant syndrome etc. People who are prone to alcohol or substance addiction end up consuming more carbohydrates and proteins. Which results in obesity along liver and heart problems, also addicted people don’t follow three meals a day pattern and prone to skip meals when they are high so it results in digestive problems in alcohol addicts and nervous and respiratory damage for people with substance addiction. Proteins play a major role in tissue repair and growth. Lack of protein slows down healing process, muscle soreness, Insomnia. An average woman requires 45g and average man requires 55.5g of protein every day. Cereals, Dark and medium green leaves, Egg, Fish, meat and Liver. Carbohydrates are fuels for body heat and work. Lack of carbohydrates causes low blood sugar and ketosis. Experts suggest you to intake one-third carbohydrates of required calorie intake an average human should take 750 calories of carbohydrates. Potatoes, nuts, whole grain cereals, pastas, brown rice etc. Minerals are used to develop body tissues for metabolic process and protection. Lack of minerals causes osteoporosis, anemia, numbness, kidney disease and extended vomiting. Minerals requirements can be satisfied from consuming 200-250ml of soya milk or 30g of cheese and also from dark green colored vegetables. Dark green colored vegetables, Diary Products, Egg (not iron). Vitamins are used in metabolic process and protection. Lack of vitamins causes Night blindness, Scurvy, Rickets, Beri beri. Vitamin A 70mcg, Vitamin C 383mg, Vitamin K 156mcg, Vitamin D 12mcg. Liver, fish, meat, milk, fruits, beans, fats and oils.